There are seventy standard 'V'-tools in the Sheffield list, plus the specials like back bent, side bent and incannel variations, so the chances are that sooner or later, you will end up needing to sharpen one of them. 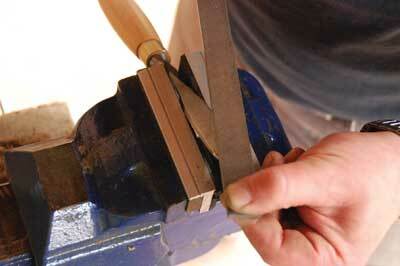 A common misconception about 'V'-tools is that they are an absolute pain to sharpen. They are a complex shape so they will always be a bit tricky, but like so many things, it only takes a little bit of understanding and you're away. The first thing to understand is that 'V'-tools have three cutting edges: two chisels and a gouge at the meeting point between the two (see gallery image 2). 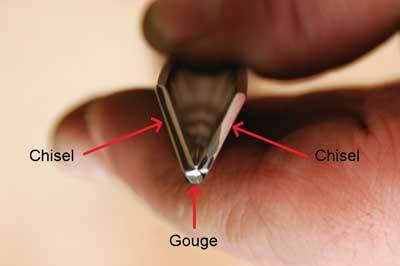 The gouge may be small but it is the most important bit to get right if the tool is to function correctly. The place where most people suffer is that they treat them like two chisels and don't even realise that the gouge is there. 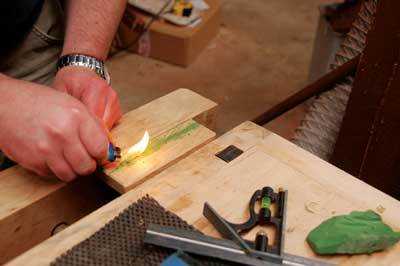 As a result, they end up with a spike in the centre of the tool. I have even heard of people claiming that they are supposed to have a spike at the centre to guide the cut - this is misleading balderdash and should be carefully and politely ignored. 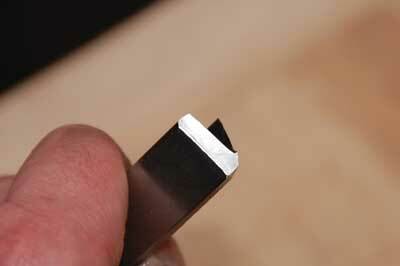 The sides of smaller 'V'-tools can be sharpened as you would a straight chisel, with full bevel contact. This should leave you with a horn of steel sticking out at the centre of the gouge (see photo 3). 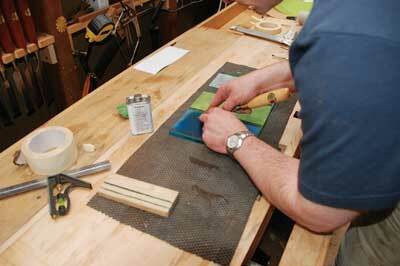 Work the gouge section until all three cutting edges are aligned. 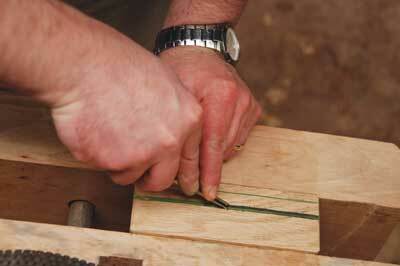 The gouge will take a little time to sharpen as its bevel at the centre is at least 40% longer than the chisels. I like to take mine back slightly further than the chisel bevels, as this allows the tool to engage at a lower, more comfortable angle. Whatever happens, it is vital to keep a straight line from the cutting edge to the heel of the bevel, as it is this heel that provides the registration point when you are using the tool. For larger 'V'-tools, high performance files are fantastic for getting them to the shape you want quickly and under control, and they are much less likely to get you into a pickle than using belt sanders etc. Ordinary files will just skid over the hardened steel, but diamond files or high performance metalworking files, will produce good results. Here I'm using a Bahco Oberg cut file which has wavy rows of chisel tips rather than the usual single or double cut arrangement. It can be quite aggressive so you only need to keep a small number of strokes in the same plane, but it leaves a remarkably smooth surface. For smaller tools and for refining the filed surface on larger ones, I use the scary sharp technique - sheets of 3M lapping film stuck to a sheet of 10mm float glass (see gallery image 5). 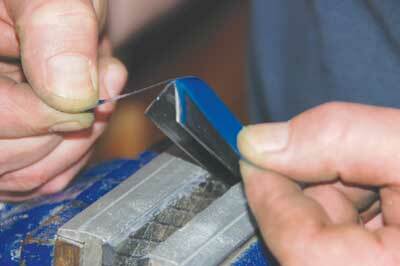 A small strip of 40 micron film can be used 'shoeshine' style to refine the surface of the gouge section after filing it to shape (see gallery image 6). Once the surfaces are all flatted down to 40 microns, you can move on to the finer grades of lapping film, or use a buffing wheel and honing compound to polish them and produce that ultra crisp cutting edge. 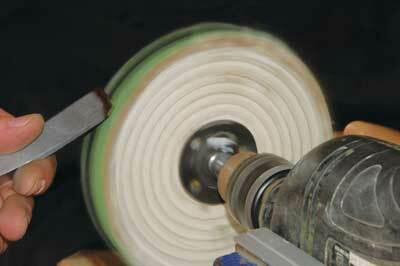 Work the wings flat on the wheel and then roll the gouge section over the surface to polish it. 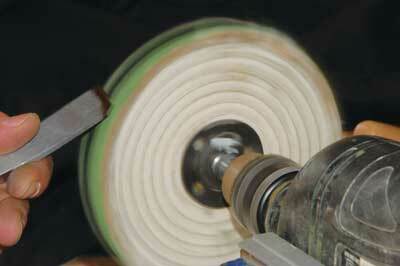 The honing step can be repeated several times before re-sharpening is necessary. 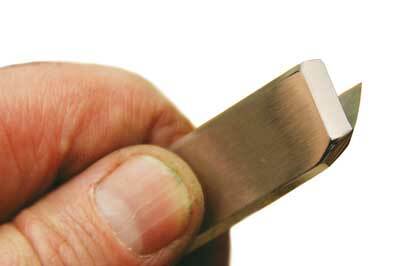 Very small 'V'-tools, like the Peter Benson Detail Selection range, can be sharpened with lapping film and honed using a block of wood with a channel cut into it using the 'V'-tool. Line the channel with honing compound - you may need to carefully warm it up and rub it into the channel (see gallery image 8) - and then simply draw the tool backwards along the channel to hone the cutting edges (see gallery image 9). If the compound turns black, you know it's working. So there you have it. By applying a few simple methods, you should be able to achieve a near perfect profile for your 'V'-tools, whatever their size or style. 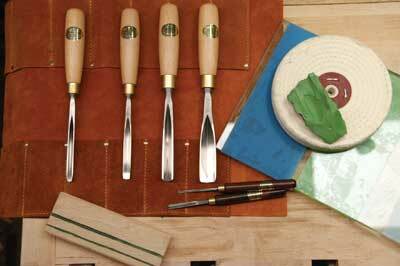 To see the range of tools which Matthew stocks at Workshop Heaven, visit his website here.